There was a special Christmas-themed box, but this is the actual December box. 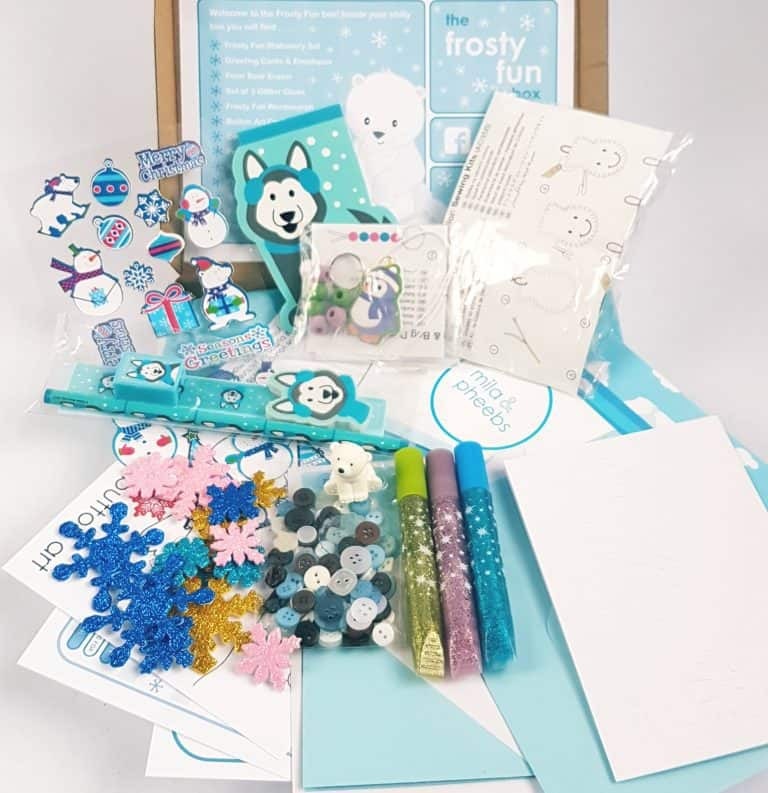 The theme is Frosty Fun! The box is small and fits through the mailbox, but it’s amazing how they fit so much into it! This month’s contents list. Love the blue theme, and the dancing penguin is gorgeous! 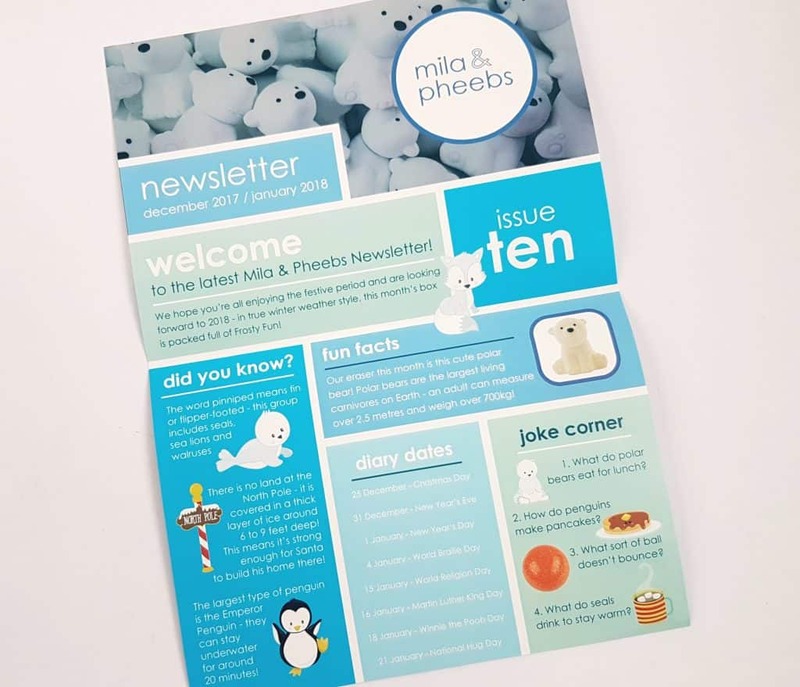 Every box contains a lovely newsletter. 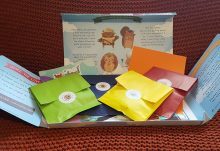 Jokes, fun facts, great to increase the kids’ little stash of mental trivia! All the different blues fit beautifully with the frosty theme, and the font is nice and easy to read. I particularly like the jokes! 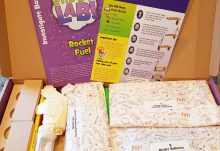 There are a couple of DIY kits to make every month. 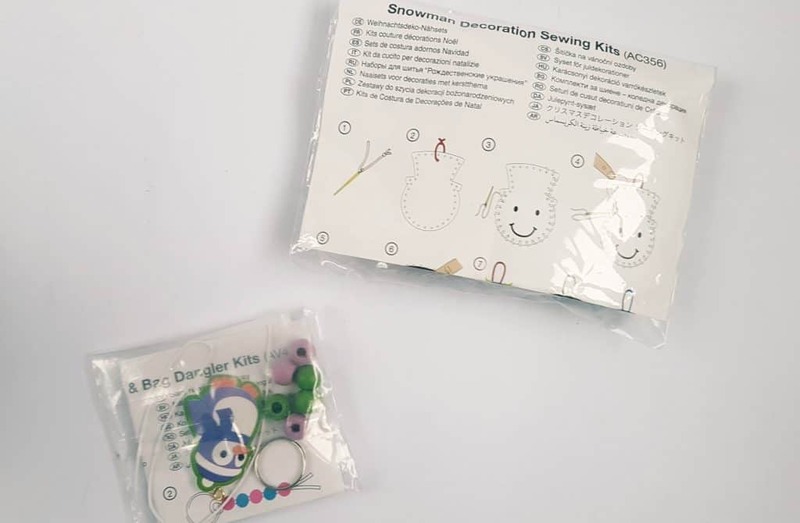 There’s a sew-and-stuff snowman above, and below is a cute little penguin keychain! 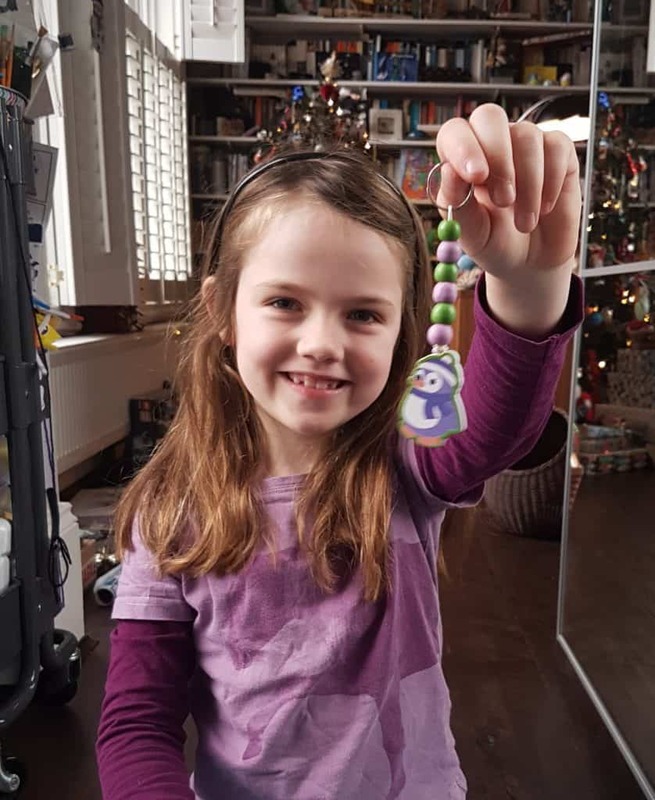 Little C loves these keychains! There was an ice cream version in one of the boxes over the summer, and Little C was very pleased to add to her collection! 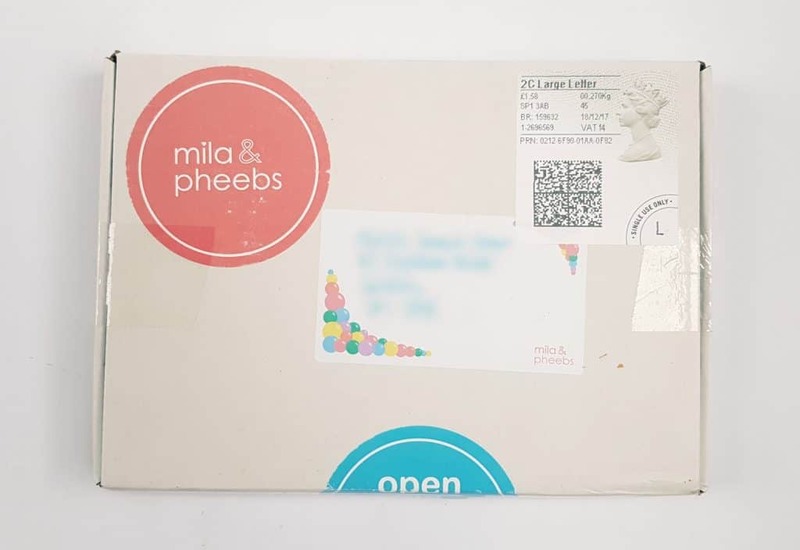 Mila and Pheebs do a great line in stickers. There’s always a nice sheet of theme-appropriate sparkly/foil stickers, plus a selection of chunky foam stickers. The snowflakes are particularly nice, all sparkly! 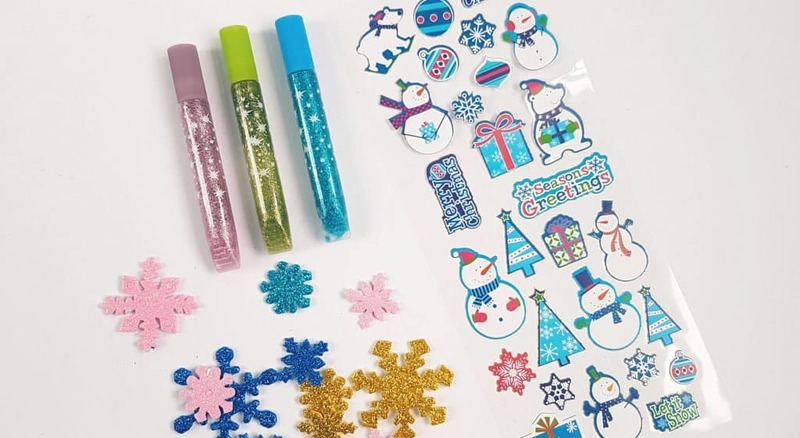 The glitter glue is an extra bonus; not only is it lovely (and matches the stickers) but you can also use it for the button collage! 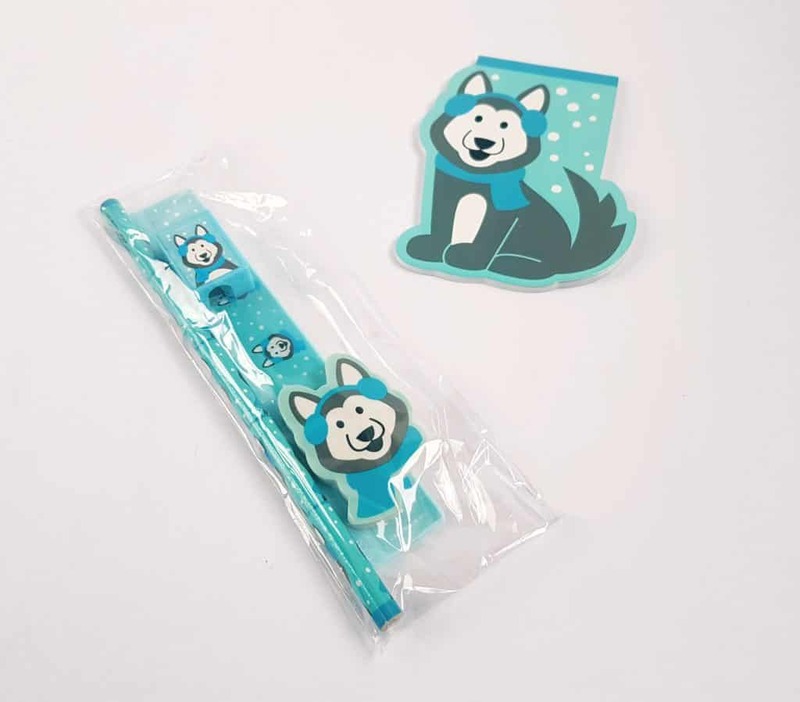 This adorable husky dog features on the stationary set. There’s a pencil, sharpener, eraser, and ruler, plus a little notepad. The notepad has a faint version of the picture on the pages, so you can either use it to make your own versions of the husky or just use it as a regular notepad. 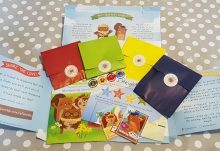 Little C has built up quite a stock of these, notepads are always popular with children! 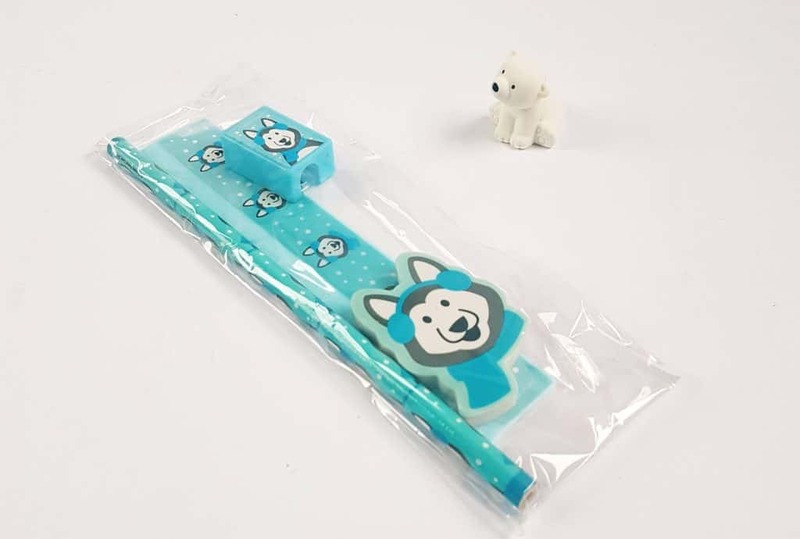 This month’s iwako eraser is a little polar bear! He’s so adorable, and will be a splendid addition to the ones that live on one of our bookshelves. Finally, the creative paper things! 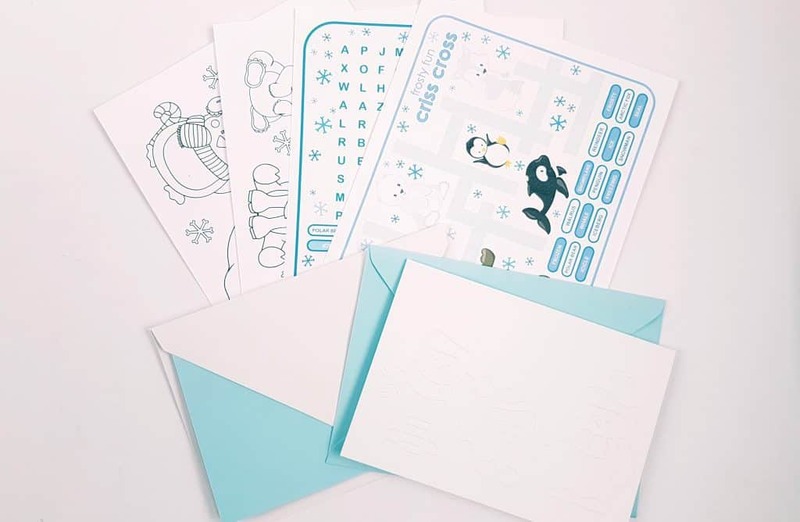 Colouring sheets, a couple of greetings cards (it’s hard to see the design but it’s very cute penguins!) and of course a wordsearch and a criss cross. Little C loves wordsearches (they do a lot of them at her school, which I think is splendid) and this one is just the right level of challenge. 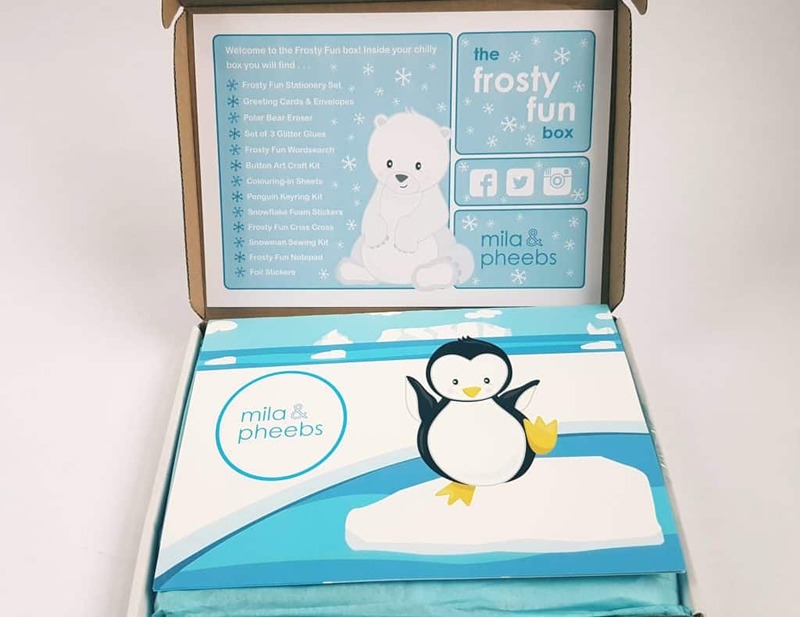 I do like the Mila and Pheebs boxes very much. They are cheerful and fun, and the themes are pleasingly neutral. As there was already a Christmas box, I love this nice wintery theme. It’s especially welcome because the cold snap the other week is totally over and it’s much more drizzly and grey now. I like a bit of frost, especially round Christmas! Everything is neatly self contained. 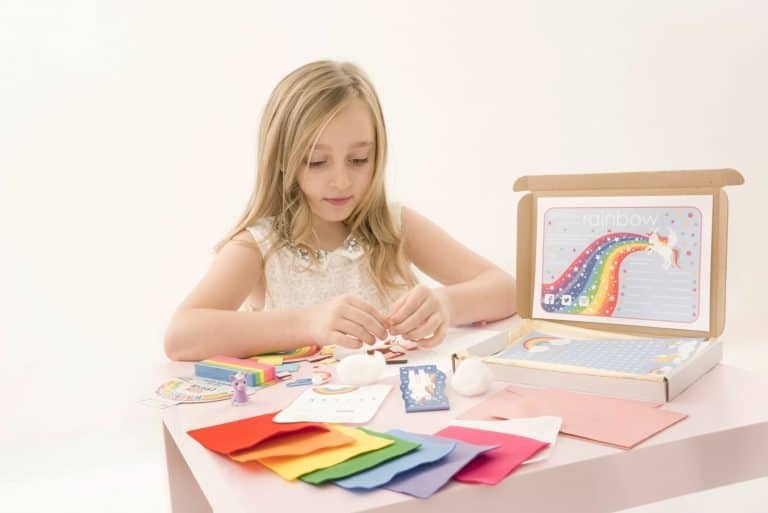 Including glitter glue is a great idea with the buttons to stick. And of course glitter glue can be used on its own. It’s probably a bit late to order this for a stocking filler, but it’s the ideal thing to have to hand over a long rainy weekend, train or plane journey, or even to keep children amused at a wedding or party. Throw in a bit of extra paper and some colouring pens and you’ve got enough to keep them going for ages. As it takes up very little room you could pop it in your suitcase to take on holiday. You could even use it as a very superior party bag! 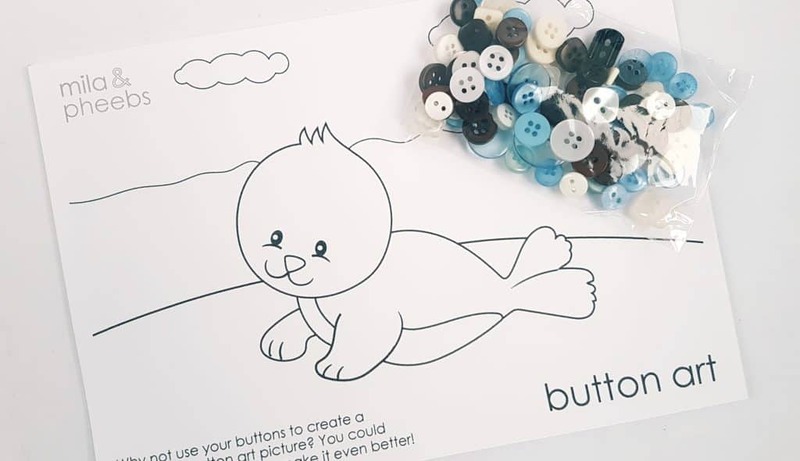 The website says it’s aimed at kids from around six years old, but I reckon a four- or even three-year-old would have a lot of fun with this. You might need some supervision when it comes to things like the pencil sharpener, but stickers and drawing? That’s practically any age! 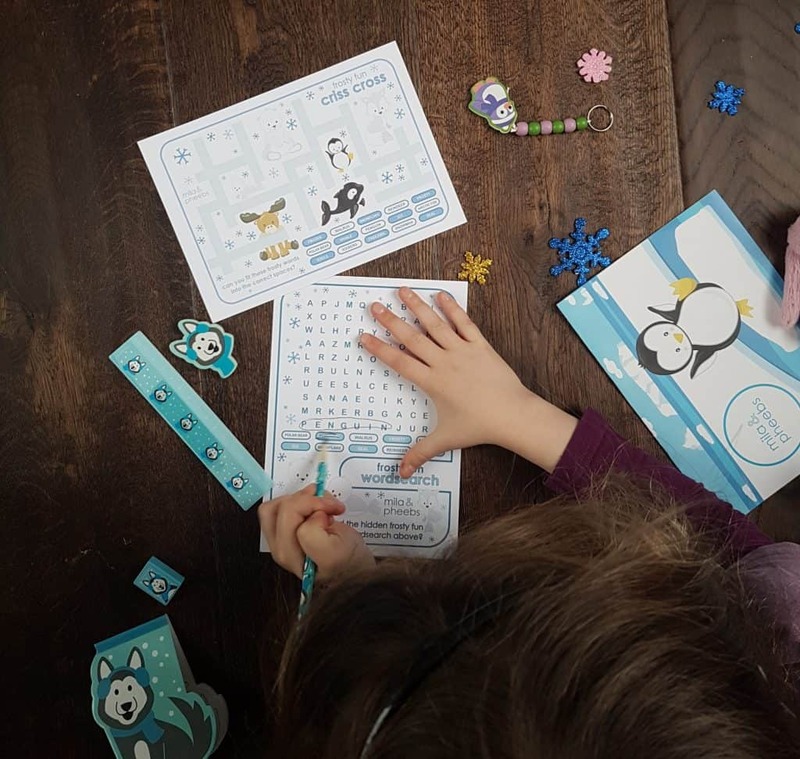 And even though the word games might be slightly beyond their skills, most kids are starting to look at letters and things at school, so they would still be a nice learning tool. Get hands-on folks! 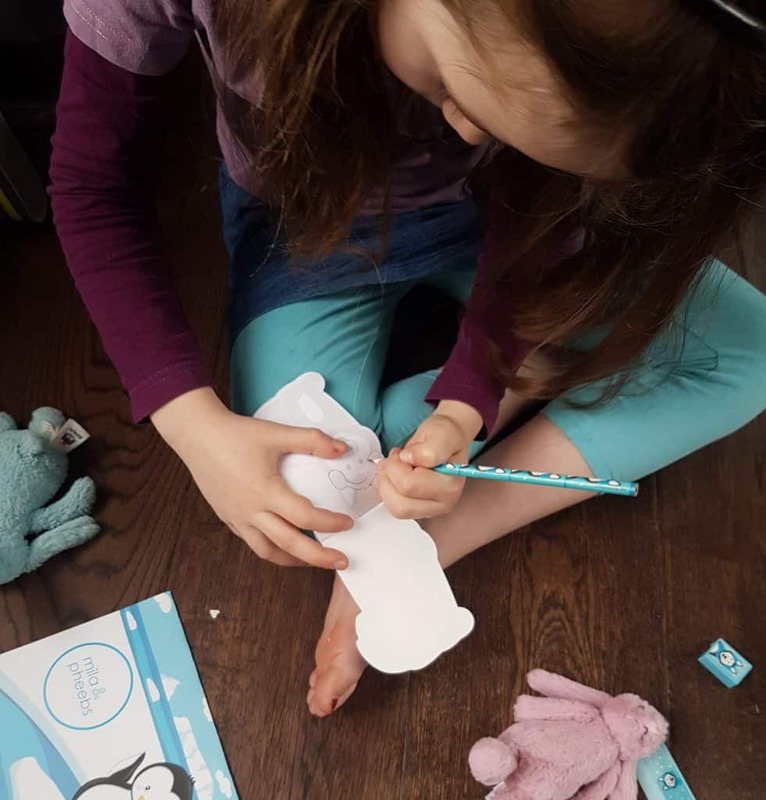 Part of the point of a subscription box is that you are paying for someone else to do the work for you, and in this case it’s selecting and producing a lovely themed box of stationary. I do think it’s good value, not least because there are items that you can keep and use again and again. 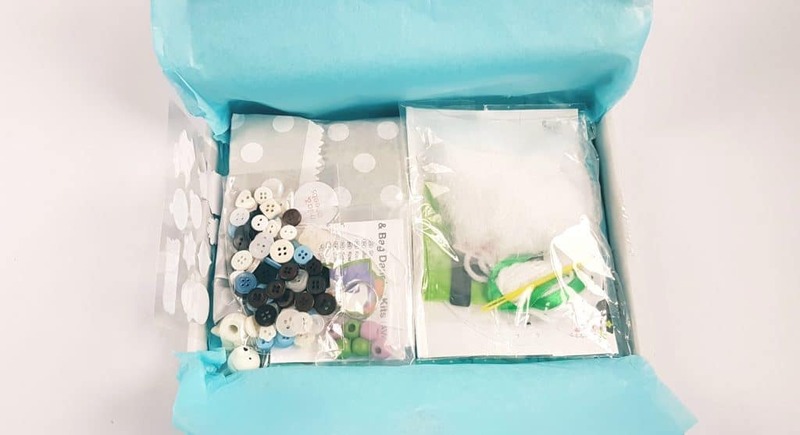 I don’t know about you, but there’s no way I have time to track down and organize something like this that brings little C a great deal of delight! I seriously admire Alexis, who manages to produce these lovely boxes whilst running around after twins. Have a fun and frosty winter!